First performed in Paris in 1840, GISELLE is universally considered the world’s most romantic ballets. 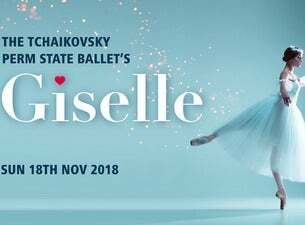 The story revolves around a peasant girl, Giselle, who dies of a broken heart after discovering that her lover is betrothed to another. Her cause is taken up by The Willis, a group of mystic and supernatural spirits of maiden girls, who obtain revenge by literally dancing men to death. Led by Myrtha, The Queen if the Willis, they are ruthless and hateful of men because they have all themselves died of a broken heart. Queen Myrtha summons Giselle from her grave and they target Giselle’s lover for death, but Giselle’s great love eventually frees him from their grasp. The Tchaikovsky Perm State Ballet’s traditional production, sympathetically accompanied by the wonderful RTÉ National Symphony Orchestra to Adolphe Adam’s original score, will leave a lasting impression. This is one of the truly great ballets!